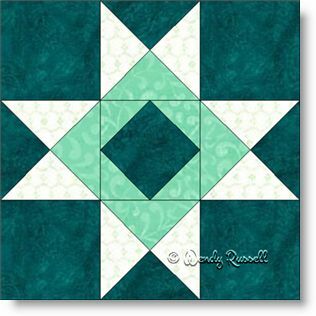 The Lily Star is another variation of the Ohio Star quilt block. This Lily Star just changes up the centre of the block to use the square in a square patch rather than a simple square. Quarter square triangles are used to finish up this nine patch block and it goes together in no time. The two sample quilts illustrated both keep the background dark, rather than the usual lighter fabrics. Different looks are achieved in both of these quilts which are set on point. Now it is over to you!